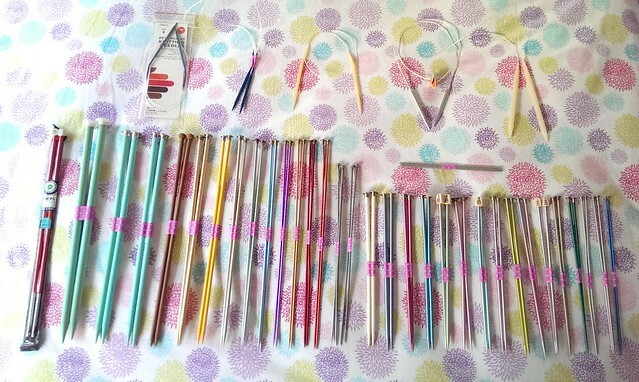 I just got SO MANY knitting needles off eBay, it's ridiculous. For me, part of the charm of crafting is collecting my materials and staring at them, so I couldn't resist carefully sorting them by size and length, and taping them neatly together. It's mostly metal (aluminum) needles, with a few pairs of plastic, one pair of wood or bamboo, and a few circulars. Oh and there's 2 red crochet hooks on the left end. I love to teach people how to knit, so I hardly ever have straight needles, because I am always giving them away to the people I teach. This substantial score should give me plenty to teach with in the upcoming months. The pattern is the Old Shale Shawl and is free on Ravelry. 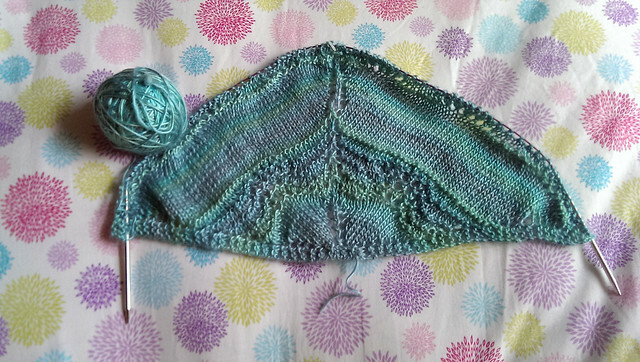 I'm using Red Heart Unforgettable yarn in Tidal, on size 8 needles. I like it so far, but I'm wondering if a flat, less tonal yarn would have worked better to show the lovely texture in the stitch pattern. We'll see. So far it's not too hard to follow, but you must pay close attention - it's not a mindless knit. I've made a few small mistakes, but nothing terribly noticeable, or that I couldn't fix by adding a stitch in the next row.